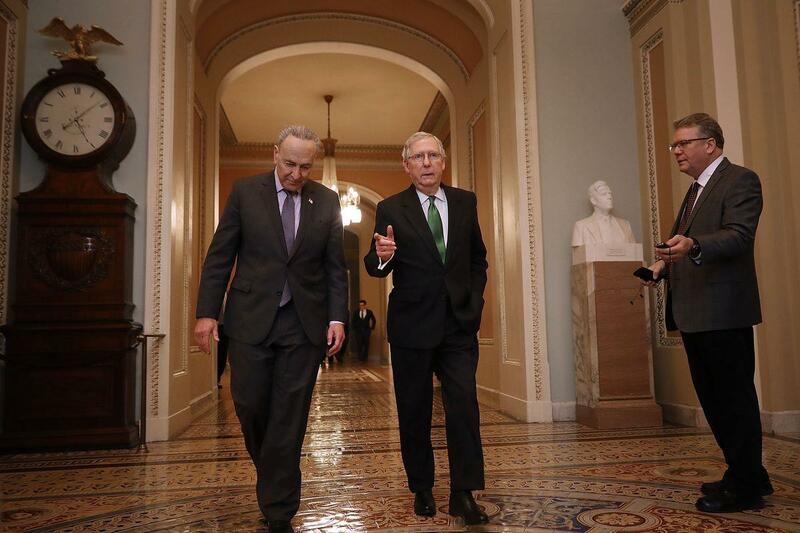 WASHINGTON, Jan. 24 (Xinhua) -- A Democrat-backed bill to temporarily open the U.S. government without funding a border wall requested by the White House failed to pass the U.S. Senate on Thursday. The bill, which would fund government agencies until Feb. 8 and needs 60 yes-votes to process, was supported by 52 and opposed by 44. No Democratic senator voted to block the bill, while six Republican senators, Lamar Alexander of Tennessee, Susan Collins of Maine, Cory Gardner of Colorado, Johnny Isakson of Georgia, Lisa Murkowski of Alaska and Mitt Romney of Nevada, voted in favor of the bill along with Democrats. Senators on two sides of the aisle traded accusations after the votes, blaming each other for the government shutdown and the failure to reach consensus. "We can absolutely have a conversation about border security once this shutdown ends, but Republicans need to stop covering for President Trump's partisan games and work with us to end this crisis," Democratic Senator Patty Murray of Washington said. "It's unacceptable that Senate Democrats continue to reject every opportunity to compromise in good faith," Republican Senator David Perdue of Georgia tweeted. The failure of the bill, along with the failure of another bill backed by the White House earlier Thursday, means that the Senate will need to renew their effort in reaching a consensus on the border wall and reopening the government, which has now been shut down for 34 days.